Widely considered to be one of the finest examples of classical Greek marble sculpture to survive from antiquity, the work depicts the winner of a chariot race that took place almost 2,500 years ago and was excavated at Motya, a Phoenician stronghold in modern Sicily, in 1979. The grasslands of southern Italy were known for horse breeding in ancient times, and inhabitants of the Greek cities there won many victories in equestrian evemts at at Olympia and Delphi. The detailed sculpture was probably commissioned by the charioteer himself as a matter of pride or by his homeland as a mark of honour. It shows the victor in a triumphant pose, dressed in a typical long tunic or xystis, and a broad belt to which his reins would have been fastened. This prevented the reins from being pulled out of the hands, but also dangerously stopped the charioteer from being thrown free in a crash. Even the veins of his arms, standing out with the exertion of his recent victory, are depicted. We have just celebrated the success of our athletes in the 2012 Olympics, but in the ancient games victors were also lauded in their home cities, fêted with parades and public honours such as free meals and theatre tickets for life. 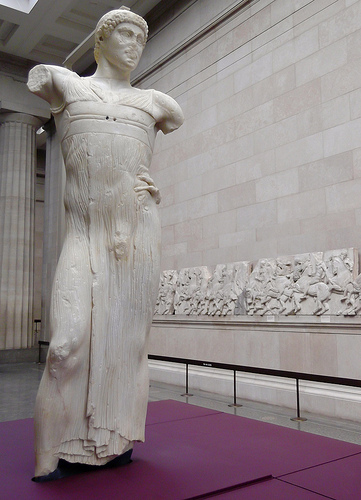 Normally housed by the Museo Giuseppe Whitaker on Motya, the Charioteer was loaned to the British Museum by the Regione Siciliana, Assessorato dei Beni Culturali e dell’Identità Siciliana, with the help of the Italian Cultural Institute in London. The Motya charioteer can be seen on display adjacent to the sculptures from the Parthenon, near sections of the frieze depicting chariots and charioteers on parade, until 19 September. Admission is free.